Things are constantly changing and – hopefully – improving. It’s basically still about having options and achieving something together, but the game-mechanics are getting more and more in the background, as long as the general feeling of a working game-mechanic is present. It’s about telling the story with the utmost possible imagination level. As a dungeon master you’ve to prepare a lot and be prepared for most possiblities. Combat is, in most gaming rounds, an essential part, it’s some kind of highlight in the game. Now this is about improving the overall gaming experience for you with a few ideas that we’re working on or have been working on for a decade now. Descriptions are the key, but without everyone taking a part in this it will hardly work. Therefore we have two parts of the story – for once the dungeon master part and secondly (and often more important – the player part). 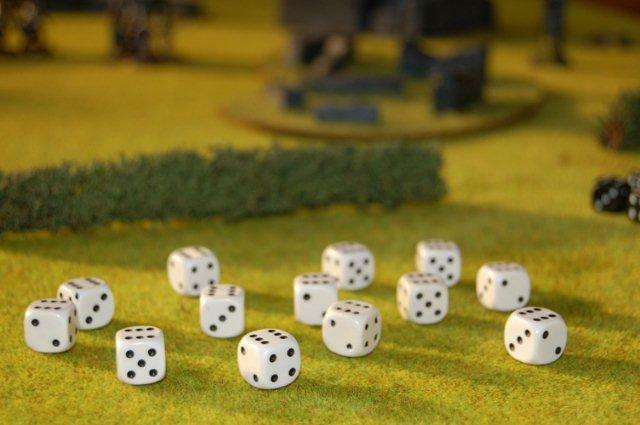 Light conditions, something “we” (at our gaming table) tend to forget quite often – unfortunately because it makes for a great factor when it comes to thrill. Weather if you’re outside, slippery surfaces, lightning, snow, ice, fog and many other things make quite a difference when you’re dealing with a bunch of orcs. The player, having the comfortable option only to focus on one or usually max 2 characters (in case of animal companions, familiars or cohorts) has his own responsibility in participating actively (as active as possible) in the description of everything around him. Depending on time, day and general comfort and condition of the players this might come very natural or might be a real tough challenge… I try to motivate my players (when I’m in the DM role) as much as I try actively to participate in creation of the atmosphere when I’m on the player-side of the table. Only by participating in the game one is able to change something and move on in the whole process. Describe your own actions, especially during social and combat interactions. The more you describe, the more the others will see of your scene. Participate actively instead of passive reception of happenings. Try to sniff in the air, wonder about the latest description, ask for details, be creative – the world isn’t the dungeon master’s solemn responsibility. He’ll let you know if you’ve gone too far but as a player you really can help keeping in tough situations the spirit high and the imagination going. Finally a list of ideas what can happen to your (np-) character (or your players) and some ideas what is affected by this. This entry was posted in english, Roleplaying Games and tagged combat, describe, descriptions, experience, pathfinder, rpg by TheLemming. Bookmark the permalink.